Meal Planning Saves Time, Money and Sanity. Here’s How You Can Make It Happen in Your Home. Ever follow an Instagram account just to see regular posts of amazingly perfect food photos? Yeah, us too! But there’s food fantasy and then there’s reality. And while almost no one can whip up dinner in 60 seconds flat, you can make the journey from store to table a whole lot easier with meal planning. A meal plan is like a budget for your food. You decide up front and on purpose what you’ll eat for dinner throughout the week. You can have pizza seven nights in a row, go out to eat on odd-numbered days, or cook every single meal at home. It’s totally up to you! Meal planning done right can change the game for both your family and your budget. Read on to learn how. 1. Meal planning saves time. At the start of each week, you’ll spend about 30 minutes planning for the next seven days. That’s probably more time than you’re spending now, but by working a bit more on the front end, you’ll save tons of time on the back end. Imagine going home in the evening and knowing exactly what needs to happen to get food in the mouths of your people. Imagine no more running to the grocery store after a long day or brainstorming last-minute ideas with an open fridge door and a sad, sad pantry. Planning ahead saves time! 2. Meal planning saves money. Get organized before you hit the grocery store, and you’re less likely to buy food you don’t need. Do some recipe research, make a list, and come up with a grocery game plan. By planning, you’ll get full use of the ingredients you do buy and won’t end up throwing food away. What could be more convincing than that? Maybe this: Get frugal with your grocery budget, and you could reduce the amount of money you spend on food each month. That means more of your hard-earned cash can go toward financial goals like paying off debt, building an emergency fund, saving for a vacation fund, or even enjoying more date nights with your spouse! 3. Meal planning saves your sanity. Now that you’ve planned ahead, you can come to the kitchen totally prepared. You can even challenge yourself with a new recipe or invite your kids to join in as you whip up a family favorite together. Put on a little music, listen to a podcast, or chat with your crew as you relax your way to dinner. There’s no reason Instagrammers should have all the fun! Cooking really can be a joy. Think back to your elementary or middle school days. Did you ever write a how-to paper on making a peanut butter and jelly sandwich or brushing your teeth? You could produce a PB&J with zero help from mom or dad and brush your teeth with your eyes closed—but putting all the steps down on paper took a little thought and effort. It’s the same concept with meal planning. Getting a plan down on paper might look intense now, but it’ll feel like second nature in no time. Grab your calendar, a notepad and a pen and head to the kitchen (or use your phone!). Decide when you’ll shop for groceries. Write this day down as the start of your meal planning week. Consult your monthly budget to figure out how much you can spend on food each month. Divide your total grocery budget by four. Write this number down as your weekly spending limit. Take a look through your pantry, fridge and freezer. Make a list of any items that are expiring soon or could be put to good use in the upcoming week. Peruse your favorite cookbooks, food blogs, Pinterest and family recipes for meals you’d like to make. To make research easy, we love getting ideas from eMeals! Take a look at the list of items you already have on hand and compare with the recipes you would like to make. Look for crossover—any place where what you already have can be used toward a meal you’d like to make. Circle those ideas. Check your calendar and make note of any dinners already on the schedule, including meals out with friends or date nights. Shop for your groceries, come home, put them away, and bask in the knowledge that you just did a good, good thing. In all the excitement of creating your first meal plan, you might forget a few key things. That’s why we’re here to remind you! Keep basic breakfast, lunch and snack items on rotation in your grocery list. We eat three square meals a day around here. And chances are, you do too. An easy place to start is to focus your meal planning on dinner, but that won’t be enough to get you through the week. Remove decision fatigue by eating mostly the same foods for breakfast, lunch and snack. Leave room for leftovers (and life) in your weekly plan. You won’t finish every meal you make, and that’s a good thing! Build leftovers right into your schedule to cut down on food waste. You might also want to make allowances for days when you’re just too tired to use any appliance but the microwave. Don’t complicate dinner. Ditch the idea that you need full-on recipes for every meal. Grilled cheese, tacos, spaghetti, a simple pizza, and meat with a veggie and potato are all easy and delicious. Stock your pantry, fridge and freezer with staples. Think long-lasting, flavorful or nutrient-dense items like rice, pasta, canned beans, canned tomatoes and sauce, chicken broth, frozen veggies, minced garlic, butter, milk, eggs, and grated parmesan cheese. Keep a running list of favorite meals. Whenever dinner’s a hit, jot down the recipe title, source and helpful hints in a notebook or your phone. Make it easy and cook those meals the most! Simplify the planning process with themed nights. Assign categories based on days. You might try: Meatless Monday, Taco Tuesday, Crockpot Wednesday, Breakfast-for-Dinner Thursday, Pizza Friday or Soup Saturday. Be sure to mix things up. For example, Taco Tuesday can look like crunchy beef or soft chicken tacos, black bean and cheese quesadillas, pork nachos . . . the list goes on! Plan a weekly cleanout. Speaking of themed nights, this might be the best one of all! You’ll essentially plan not to plan. You can eat leftovers, a frozen meal made by you, or get creative in the kitchen by throwing a bunch of ingredients together. When you use what you already have, it means more money in your pocket and less food waste. Try a meal planning service. Not sure what to plan? Or how to even get started? Check out e-meals for budget and family friendly meal plans. Make it easier to stick to your shopping list. Order your groceries online and pick them up in the store or visit a bare-bones grocer like Aldi or Trader Joe’s. The best way to reduce overspending is to remove the option. 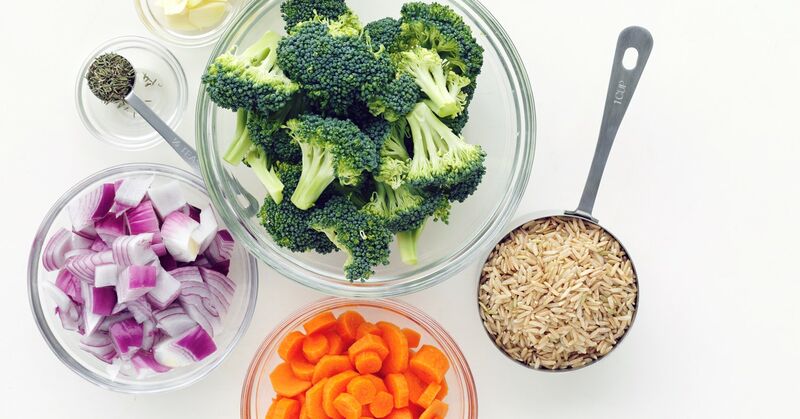 Add meal prep to your to-do list. Look over your recipes for cooking tasks you can do ahead of time. Spend an hour or two washing, chopping, baking, and boiling individual ingredients. Store prepped food in the fridge and enjoy the easiest week ever. Double recipes whenever possible. Making two lasagnas today takes less work than making one today and another next week, right? Up your efforts for double rewards and throw that lasagna in the freezer to enjoy at a later date. Don’t forget about your leftovers. Make sure your leftovers make it to the freezer if you won’t be able to enjoy them before they go bad. Or better yet, bring leftovers for lunch! Packing your lunch is an easy and delicious way to save money. Let us know how meal planning improves your life and your budget on our Facebook page!